I realize that was confusing. 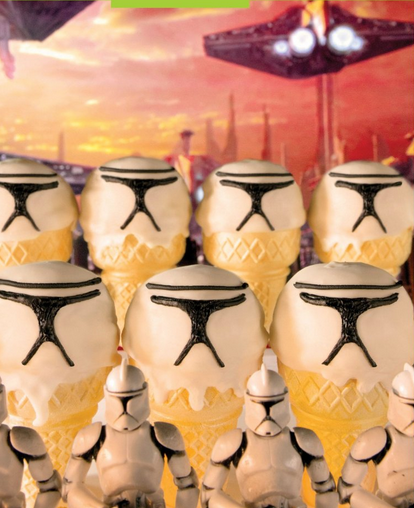 Are these Ice Cream Clones a) Delicious, b) Gluten-Free, or c) A huge failure? The answer may surprise you. It’s all three!!!! I mean, you knew that last one just by looking. But just in case you didn’t understand how it was delicious, there’s (gluten-free) vanilla ice cream inside of those (gluten-free) ice cream cones covered in (gluten-free) white chocolate and (gluten-free) decorating pen. 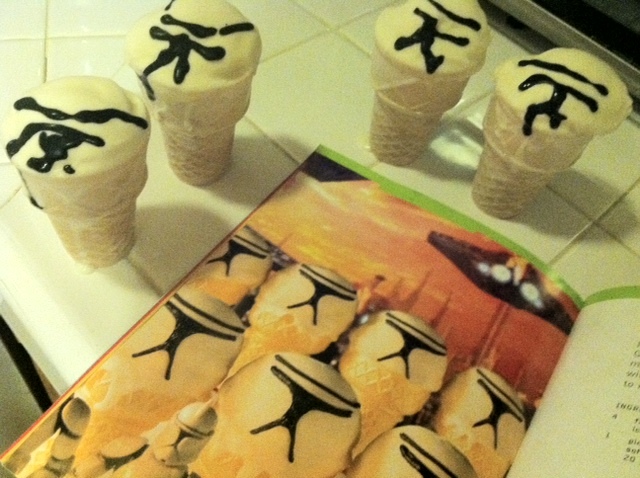 It’s supposed to be clones from the Star Wars Cookbook, but in my art-less hands, it’s stripes on an odd-shaped ice cream cone. I mean, can anyone really do this? Tags: gluten free dessert, gluten free junk food, gluten-free cookbook, gluten-free ice cream cones, pinterest. Bookmark the permalink. Well I can’t eat ice cream, but I just wanted to make you aware that there is no way…I mean no way I could make those turn out right!! You actually have succeeded in my eyes! You made gf goodie that tasted good…..UUmmmm yea most of mine…not so much!